Androni-Venezuela continue their attempt to develop Venezuelan cycling by taking young riders from the South American country to the highest level in Europe. The team has signed a four-year contract with 18-year old Carlos Gimenez who will turn professional in 2015, and the climber reminds team manager Gianni Savio of Jose Rujano. Gianni Savio who manages the Androni-Venezuela team, has had much success finding young South American talents and bringing them to Europe with his Italian team. His biggest coup came at the 2005 Giro d'Italia where his young Venezuelan climber Jose Rujano surprised the world by winning a stage and the mountains jersey and finishing 3rd overall. Rujano has had a difficult career and was unable to perform at his best while riding for some of the biggest teams in the world. 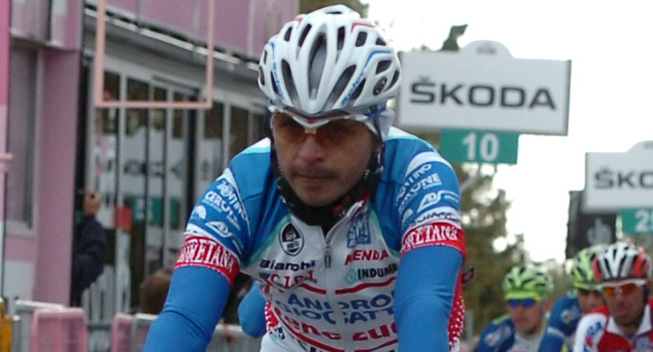 Having returned to Savio's team in 2011, he rediscovered his best legs and won another stage of the Italian grand tour. Things unraveled in 2012 when the parties had a public discussion over the reasons for Rujano's abandonment in the Giro and they parted ways prior to the 2013 season. Rujano has since ended his career but Savio still dreams about finding another talent like the outstanding climber. He now claims to have find a rider that has many of the same characteristics as Rujano. 18-year-old Carlos Gimenez has signed a four-year contract with the Androni-Venezuela team and will turn pro in 2015. "When I watch him riding uphill, he reminds me of Jose Rujano," Savio said. "He has the same position on the bike and an identical pedaling style but fortunately - as far as I know - a very different mindset. I have followed him in Venezuela and at the recent world championships in Florence, I watched him in the juniors race. "Above all, the tests conducted by professor Fabrizio Tacchino showed optimal values and a really great engine as they say in cycling. I've signed a four-year contract but Carlos Gimenez will make his professional debut in 2015 because next year he will ride in the U23 ranks." Savio has started a project with the president of the Venezuelan federation, Artemio Leonett, to develop the South American country's talents in Europe. Seasoned professionals Jackson Rodriguez and Carlos Ochoa have been part of the Androni team for years while 20-year-old Yonder Godoy joined the team midway through the season. The team has signed Manuel Belletti, Johnny Hoogerland, Nicola Testi, Andrea Zordan and Gianfranco Zilioli for the 2014 season while Giairo Ermeti (retires), Fabio Felline (Trek), Franco Pellizotti (Astana) and Miguel Angel Rubiano (Colombia) will leave the team.